You must give sufficient privileges to Microsoft Dynamics CRM installation user. 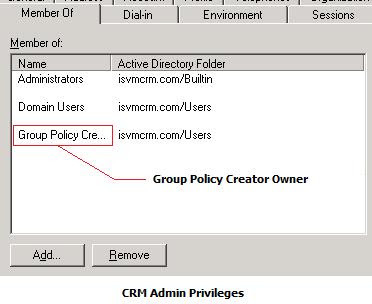 The easiest approach is for the installation user (perhaps CRM Admin) to be a member of the Domain Admins group, which is defined in Active Directory Users and Computers. Local Administrator on the computer where Microsoft Dynamics CRM is being installed. IIS Server Local Administrator Privilege.